You're going to wonder how you survived without him before. Victor has been a long time in the making. We had him made, but the final details took a bit for us to piece together. Sometimes when you create something, you create it and it births from a name. Sometimes you create something, and its name comes to you after its creation. Victor came to us after we had the design. We feel this design is strong and was deserving of a strong name. Introducing The Sphinx. An Egyptian inspired collar. She's warm, historic, and beautiful. She's bordered in small pyramid spots, and has 3 sphinx conchos on her. Along the center length are larger pyramid spots and rhinestones. You'll have your choice of rhinestone color. 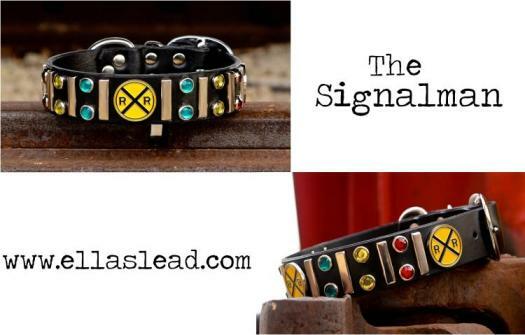 The Signalman is a new design inspired by railroad workers. My (Rebecca) father was a welder for Illinois Central Railroad (now Canadian National) for over 30 years, and his good friend was a signalman on the railroad. In 1994, his friend was working on the tracks and got hit by a train. An accident that took place and took his life. This collar is dedicated to him. A free shipping sale on orders over $50. Use code: ShipFree at checkout. This includes international orders as well. International orders will ship via first class international mail.